Spelling Power is a competent and speedy curriculum for homeschoolers. It boasts a learning system that can be executed in a mere 15 minutes a day. The details regarding Spelling Power are numerous and this curriculum represents one of the fastest and most thorough teaching methods for efficient spelling. This particular homeschooling curriculum has been around for over a decade. Spelling Power has reached its 10th edition. The most recent edition provides parents or an instructor with a tutorial seminar DVD regarding the proper usage of the program. This curriculum takes, on average, a period of fifteen minutes a day, with each spelling session beginning with a cursory five minute exam. The words misspelled during this five minute test are then the object of the child's lesson for the remaining learning time. These words are specifically chosen from a list of 5000 words that are commonly misspelled by students of your child's age group. The advantages of such a spelling curriculum seem to be clear. The curriculum advances with a child's reading level and delves into important concepts such as phonetics, testing and repetition with a focus on the words that a child misspells. A child works towards mastery of his own spelling errors, with periodic review built in to the curriculum. This method is effective in that it validates good work and focuses on improving errors. For parents who want to avoid wasting time and also wish to streamline their child's spelling abilities, such a program appears ideal. Homeschooling parents who want to incorporate Spelling Power into their regimen will need to have a child who is approximately eight years old and can function academically at a second grade level. This means his reading and writing needs to be on par with the average second grader. His phonics and mastery of the English language in terms of speech must also reach this ballpark estimate. Though many parents may not care about the religious origins of a spelling program, Beverley L. Adams-Gordon (the author of Spelling Power) is a committed Christian and homeschooler. This simple fact may be comforting to Christian homeschoolers who desire to feel supported in their religious choices. The origins of the program also seem to ensure that no questionable content will appear anywhere in the learning program. 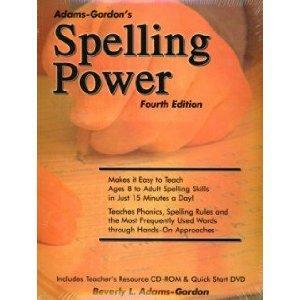 The most recent editions of Spelling Power can easily be purchased at the company's official website. It's important to note that the basic curriculum can also be supplemented by a variety of resources such as plan books and task cards alongside a few other accessories such as magnetic tiles. Though these supplemental resources are not touted as necessary by the author, if your child has a particularly difficult time mastering his spelling and grammar, these products are affordable and can be helpful. Christian homeschoolers can also purchase the program at Christian Book Distributors, though there is no obvious financial benefit to purchasing the products at Christian Book Distributors as opposed to the official website. Parents who are very budget conscious can investigate Ebay for this spelling program. However, though the cost may be lowered dramatically through Ebay, it is typically more difficult to find recent editions of the curriculum. It should be noted too that the most recent addition comes with a CD-rom of printable resources, including pages of the appropriate level spelling test booklet. This may well make it worth purchasing the program new.